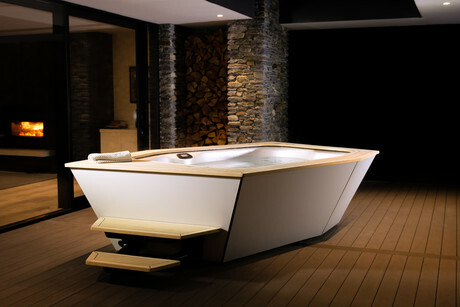 The IKON spa from Vortex Spas is available in two colours: carbon and cloud. The spa’s architectural cabinetry is made from aluminium composite cladding with flush, screwless surfaces and contemporary negative detailing. Contoured interior landscape seating allows users to move around and sit naturally in multiple positions rather than being restricted. The maintenance-free Flexiteek deck provides space for sitting or lying down, or to rest food, drinks and towels. Jets, lighting, water temperature and set-up are fully adjustable using the built-in touchscreen interface or via the Vortex smartphone app. Users can call up preconfigured spa ‘mood’ settings including ‘therapeutic’, ‘relaxation’ or ‘party’. IKON includes a Purezone UV sterilising system and a CD Ozone water clarifying system. Other features include removable floating Flexiteek steps, Aristech acrylic finish, Thermobond oven cured shell, steel frame construction, high-impact moulded ABS base and duraflex ‘no kink’ PVC plumbing. 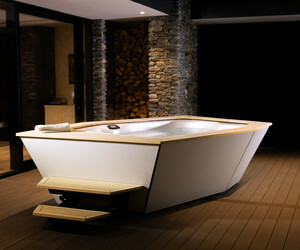 I am interested in Vortex Spas IKON spa .